Commenters then argue back and forth over the answer with many complaining about the "new" math common core has the kids learning. Some of the parents are irate going so far as to placing blame on the liberal media or our own President. Calm down already! The truth is that math hasn't changed. There is no "new" math. The common core is just a set of math and English standards, or more clearly, grade level expectations. The point of the common core is to set national learning expectations for all grade levels. That means all 2nd graders will be expected to know the same level of math all across the nation. Regardless of socio-economic conditions, budgets, or local culture. These expectations may be unreasonable or over done (I touch on this here). But the fact is the common core is here for a little while, and it might mean you parents have to brush up on things. Especially those of you that are seeing your kids come home with more homework in the early elementary grades where as young as 3rd grade they need to understand fractions...Oh no!! Fractions! 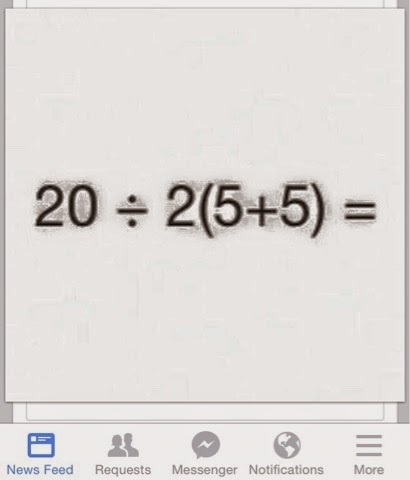 For now, the answer to the above problem is 100. Parentheses first. Then multiplication or division which ever comes first from left to right. In this case... Divide first multiply last. I never did like Aunt Sally... Smelled of cats and cabbage.. And that hair lip.. No excuse for any of that! Yuck!